Though a lifelong observer of birds, it was during his field research studying the nesting behavior of the rare Ferruginous Hawk for his Ph.D. dissertation that Leon Powers came of age as a naturalist. A Hawk in the Sun chronicles Leon’s personal adventures during his three years of unveiling the life story of this very shy desert raptor. This book engagingly ushers the reader up-close into the private life of this majestic hawk to witness its daily struggle for survival. Page by page, A Hawk in the Sun unveils the intriguing life story of the Ferruginous Hawk while at the same time entertaining the reader with wildlife adventures that challenge both the hawk and the researcher. This hawk’s running battles with attacking coyotes, and the nocturnal stealth bomber, the Great Horned Owl, as well as surviving the searing desert sun are just a few of its attending dangers. A Hawk in the Sun engages, entertains, and best of all, enlightens the reader. Welcome to the life and times of one of North America’s best-kept wildlife secrets! And there are adventures aplenty unraveling this veil of secrecy. …Even though I have studied Ferruginous Hawks for about 20 yr, I found many new things in this book. I kept coming back to the pages to find out how the coordinated nest defense against a coyote would end, how adults and young coped with 108°F (42.4°C) heat at the northern fringe of the Great Basin, whether Ferruginous Hawks hunt during moonlit nights, and so on. I learned that males share in incubation, but otherwise do not dawdle at the nest; that females discard leftover prey, and surprisingly, pellets some 100-300 m from the nest; that the hawks cache food, and more. There is a heart-breaking description of a female losing the battle over her nestlings against a coyote while her mate was away, presumably hunting. The book is enlivened by handsome drawings and photos. There are no tables, very few numbers, and few references. The ideas presented and the research described did not follow a hypothesis-testing approach, but were more akin to a naturalist’s inquiry. This approach is deliberate. …The writing style is deliberate and “from the heart.” Straightforward reporting is interposed with vivid prose stimulating the reader’s imagination. Josepf K. Schmutz, Centre for Studies in Agriculture, Law and the Environment, University of Saskatchewan, Saskatoon, SK 57N 5A8 Canada. 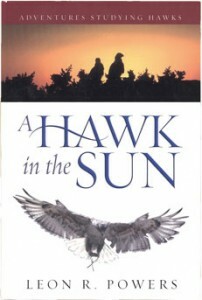 Book Review: A Hawk in the Sun, Dr. Leon Powers, DIMI Press, Salem, OR. 2003. In the chapters that follow, Dr. Powers tells of the nesting behavior of this largest of our buteos, giving facts and describing the strategy that this species uses to survive the het of the desert sun. He relates details about the biology and ecology of the species. He tells of their predation on black-tailed jackrabbits, and the other species they take in lean years. He discusses the threat to the species survival as sagebrush habitat is lost. At the same time, he tells the adventure of discovery as a young graduate student seeks to find research methods, bakes in a blind in the desert sun, and mourns the loss of failed nests. He tells of this species susceptibility to disturbance near their nest, and of his close observation of one tolerant female, Penelope. This book is not dry science, but live science. Written with a naturalist’s passion for his subject and a love of the landscape where these birds live. Well written, A Hawk in the Sun is a great read! Paul T. Sullivan, Oregon Field Ornithologists. “An exhilarating excursion into an unknown desert landscape. Not since the publication of Konrad Lorenz’s King Solomon’s Ring, has a book of natural history come along, which more completely bridges the gap between the language of the interested lay person and university trained animal behaviorist, than does A Hawk in the Sun. This book is so readable that the words literally evaporate off the pages. It unravels not only the cognitive mechanisms of pure scientific naturalistic research, but also the less often recognized spiritual connection one invariably makes with one’s own research, in such a way that the reader finds him or herself crouching beside the author, seating together with him under the hot sun, agonizing with him when witnessing the death and predation of young hawks, marveling with him at the majesticness of the hawk and the surrounding desert landscape, together embracing a spiritual journey of religious magnitude. The reader of A Hawk in the Sun cannot help but learn a great deal about the behavior of the ferruginous hawk from this slender tome. More importantly, however, the reader will gain valuable insight into animal behavior as a whole and will attain knowledge of several key concepts in the study of animal behavior which heretofore were too cumbersome and scientific for the average lay person. As a high school biology teacher, who is always looking for books which make the study and understanding of natural history and research more approachable for students, I have decided to incorporate this fine treatment of nature into my own curriculum. I am certain that my students will learn and experience the thrill of biological discovery just as I and hundreds of other students have from the incomparable Dr. (Uncle Leon) Powers. Even after fifteen years of my having since graduated from college, my mentor is still teaching and his pupil, still learning, is more attentive than ever! Daniel G. Snethen, High School Biology Teacher, Little Wound High School, Kyle, South Dakota. “Wanted to tell you how much I enjoyed your two books – I finished A Hawk in the Sun and am reading Dead Owls Flying.